A novel told through interconnected short stories, Mona Awad’s 13 Ways of Looking at a Fat Girl is about one woman’s struggle with her body image in a judgmental society. This heartbreaking but illuminating read about a journey into adulthood will help readers relate with Kate on This is Us, whose constant problems with her own body image are examined throughout the show. The Bird family looks perfect from the outside. But when an unspeakable tragedy occurs, the family façade cracks and its members scatter throughout the world. Thirty years later, the children are forced to return to the family home to figure out what happened—and how to move on as a family. The themes of estrangement and reconciliation are something Kate and her mother, Rebecca, can surely identify with in This Is Us. What happens when you separate from the man you once loved, and then that man goes missing? That’s A Separation’s premise. It might sound like the makings of a thriller, but the novel is—at its core—a gorgeous meditation on what it means to belong wholly to another person—and then to be apart. This experience will ring true to fans of Jack and Rebecca’s relationship on This Is Us. This searing YA novel about black racial identity features Starr Carter, whose home in a poor neighborhood is a far cry from the fancy (and mostly white) prep school she attends. Starr does her best to balance these two worlds, until something happens that tears her delicate balance to shreds: Her best friend Khalil is murdered by a police officer, and Starr watches the whole thing happen. As the case makes national headlines, Starr must make a tough decision about her values. Randall’s identity issues in This Is Us closely mirror Starr’s struggle to figure out where she belongs. Kailey says she loves her life;she’s got a great career and a successful fiancé. But a chance encounter with the one who got away, Cade McAllister, changes all of that. Cade, who disappeared after his relationship with Kailey deteriorated, is homeless and his memory has been shattered by his years on the streets. As Kailey works with Cade to reconstruct his past, she must confront her feelings and figure out what she really wants. Kailey and Cade’s relationship—including his dependence on alcohol and how it impacts Kailey—will resonate with anyone who appreciates Jack and Rebecca’s storyline on the show. Asha knows she is lucky to have parents who love her, but she can’t help but wonder where she came from. She knows her parents adopted her from India as a baby, and now she wants to understand her roots. This is a moving novel about what it means to belong, especially when you can’t see yourself in the people who raised you. Readers will be reminded of Randall’s search for his birth father in This Is Us. James might be in love with Lou, but it doesn’t matter: She is engaged to his best friend, Rob. So he puts his feelings aside and tries to focus on his writing. But it turns out his life is just a series of longing for what he doesn’t—or can’t—have, from finishing his book to fixing his relationship with his father to being with the woman he loves. When Lou and Rob’s marriage starts to crumble, and Lou turns to James, he is forced to deal with the consequences of finally getting what he wants. Lou and James’ story will remind readers of Rebecca’s story, as she was married to Jack but later married his best friend, Miguel. Is life a series of random choices, or is it predetermined? In Reid’s novel, Hannah Martin is almost 30 years old, but she still doesn’t know what she wants to be when she “grows up.” One night at a bar, she goes to meet her boyfriend from high school, Ethan, with her friend, Gabby. They have a good time, but when Gabby says she is ready to leave, Ethan offers Hannah a ride home if she wants to stay. In that moment, Hannah’s life splits. What happens if she goes with Gabby? What happens if she stays with Ethan? 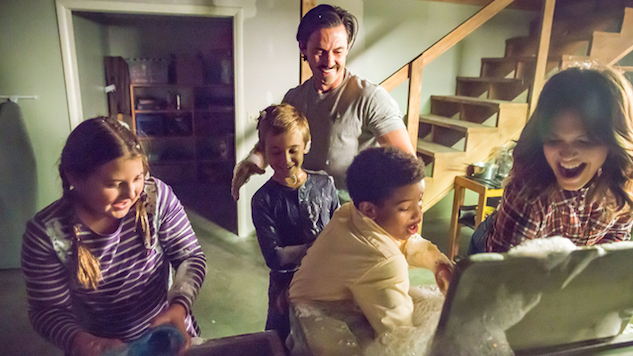 The consequences of her decision play out in two separate storylines, which fans of This Is Us will love, as the show centers on connecting past decisions with present circumstances. Simon is not ready to come out to the world yet, but he might not have a choice after receiving an email threatening to expose his secret to everyone he knows. Simon must figure out whether he is ready to own his identity as a gay teen, and let everyone around him—including the boy he has a crush on—know, or risk putting his most guarded secret into the hands of someone else. Acceptance by family, friends and peers is a salient topic in the LGTBQ community, and it plays out in This Is Us when Randall discovers that his birth father is in a relationship with a man. The Blythe twins, Persephone and Seraphina, have spent most of their lives caring for their younger sister, Juniper, who was emotionally damaged when her fiancé abandoned her in 1941. Decades later, a young woman named Edie has traveled to their home in search of her mother’s past. What Edie uncovers about her mother reveals the Blythe twins’ secrets in this gothic novel about family skeletons. The bulk of This Is Us focuses on family history, and readers will enjoy following the novel’s threads just like the show’s mysteries unravel week by week.